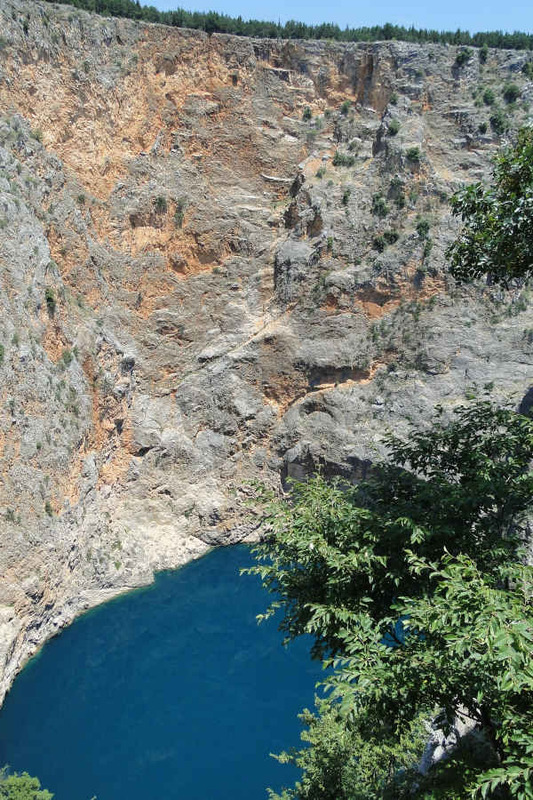 Both lakes are very close to Imotski. From Komarna you can choose two roads. The fast road using the motorway towards Split and leaving at exit Zagvozd. The toll was 12 Kuna in 2011. From the exit follow the road signs towards Imotski. You enter Imotski on road 60 from the east. Or the slower, but shorter road going through Bosnia & Herzegovina. Drive to Metkovic, turn over the bridge towards Ljubuski. Pass the border outside Prud and continue towards Imotski. Just before Imotski you pass into Croatia again. You enter Imotski on road 60 from the west. In both cases drive towards the city center when you arrive at Imotski and you will see plenty of signs directing you to the lakes. 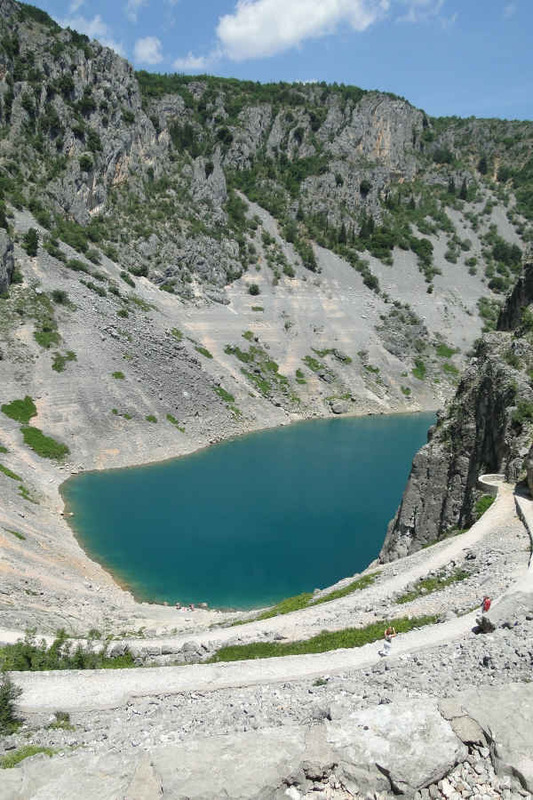 have formed the sides of the lake so it is now possible to walk on a path all the way down the 220 meter deep sides. Water depth in the lake varies a lot by season as it is fed by several small streams coming out of caves in the high walls of the lake. In August the lake may completely disappear if there has been no rain fall. From the Blue Lake there is a short 1 km. walk to the Red Lake. The lake is named after the red cliffs that form its walls. The total depth of this hole is 522 meters, and it drains out in a strong underground river of unknown origin and destination. The lake was formed by the collapse of a huge cave millions of years ago. In the lake lives a fish that is unique. It was named Delminichthys adspersus as late as 1843 and it is a small sardine looking fish of 9 to 12 cm. The fish can occasionally be found in the Trebisat river and in the rivers and stream of the flat land below Imotski, and it suggests that there is wide spread underground connections between the rivers.